Where once they celebrated together their World War Two victory as allies, Russia and the West are now staying from each other’s ceremonies. 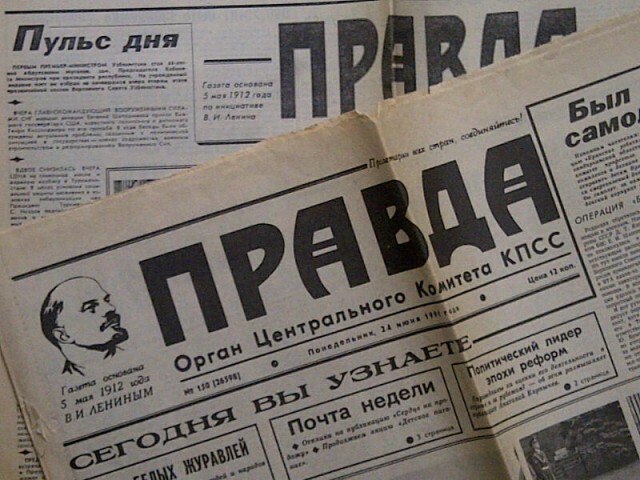 This post reflects on past VE Days in Moscow, and on a journalistic hero, Vassily Grossman. That May, as the days lengthened and the temperature rose, I stayed in the Rossiya hotel. Said then to be the largest in Europe, it sat solid on the banks of the Moskva River. On the evening of May 8th, the corridors filled with a tinkling sound. Thousands of medals chimed against each other as their owners, sometimes unsteady with age or ancient wounds, made their way along the hotel corridors. The decorated veterans had come to Moscow to celebrate the 50th anniversary of their country’s victory over Nazi Germany. Twenty years on, much has changed. Russian and Western leaders will not be celebrating together. Their views on the world today, especially Ukraine, differ too strongly for them to stand side by side. The Rossiya Hotel is gone: its brutal concrete ugliness too grim even for a modern Moscow which takes pride in its Soviet past. Gone too are the veterans, or most of them. I remember talking then to Tom, from Belarus. Of ten boys from his village school who left for war, only he returned. When I heard Mr Clinton’s words that week, I thought of Tom. Russia was fighting then, too — against separatists in Chechnya. 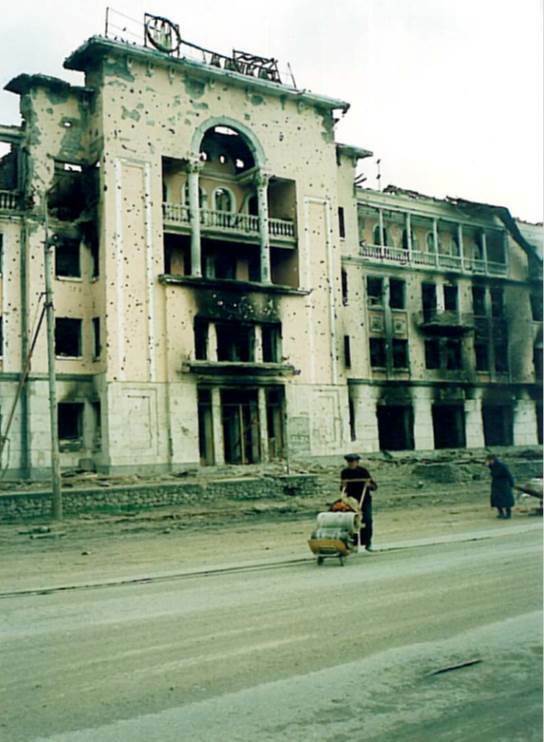 Grozny, the main city of that rebellious southern region, looked then uncomfortably like pictures of Stalingrad: city of suffering and extraordinary courage half a century earlier. It had been the scene of astonishing reporting, too — of which more later. The war in Chechnya then drew the West’s disapproval, but not attending the Victory Day celebrations would have been out of the question. The hope and optimism which had come with the end of the Cold War were simply too valuable to put at risk. It has not lasted, of course. In 2008, the West looked on with a mixture of fear and fascination as tanks rolled across Red Square on Victory Day for the first time since the Soviet era. Cold warriors in London and Washington perhaps enjoyed the guilty pleasure of nostalgia as they sensed the thrill of looking once more at what was on show. That day, I was on Red Square, part of a group of foreign correspondents, close enough to the few remaining veterans to offer in person our congratulations on the national holiday. 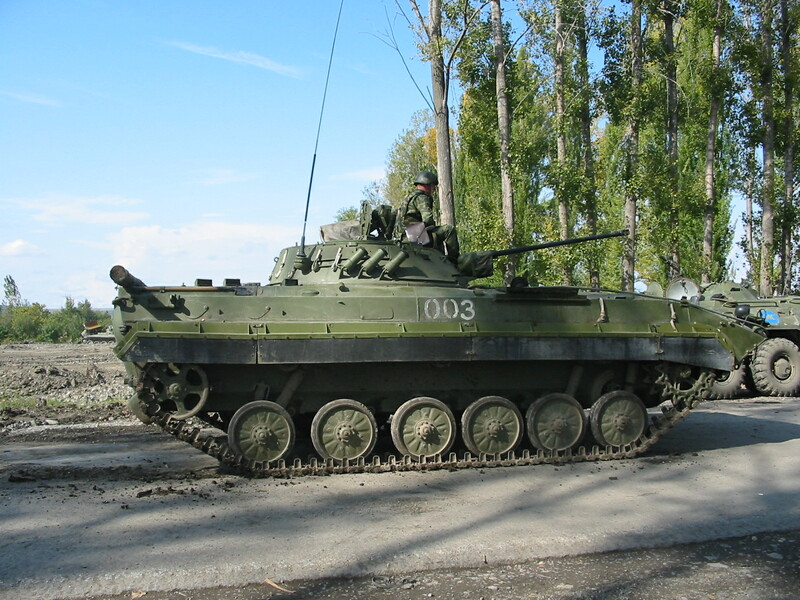 Russian forces in Georgia, 2008. Photo © James Rodgers. Three months later, the army which rolled past us that day was at war with its smaller southern neighbour, Georgia. I was soon back in the Caucasus, writing about the consequences of a conflict which largely destroyed what relatively little remained of the 1990s goodwill between East and West. Relations now are even worse: a source of sadness for those, especially of my generation, whose childhoods were overshadowed by Cold War, and who were relieved at its end. So this weekend, as I, like countless others across Europe and beyond, reflect on the suffering and ‘extraordinary courage’ of the Second World War, I will also take the time to look again at the work of one of my journalistic heroes: Vassily Grossman. I have written about him on this site before, at greater length in the academic journal ‘Media, War & Conflict’, and in my first book, Reporting Conflict. His war reporting — published in English as A Writer at War — is peerless. His account of travelling to the front in the early days of the Nazi invasion; his interview with a Stalingrad sniper; his witnessing the liberation of Treblinka: all are striking even today. If you have not read them, you should. Like the sacrifice of the Soviet Union in the Second World War, his work not well enough known in the West. Civilians in Grozny, Chechnya. 1995. THE POWER OF THE PRESS may humble the mighty, but it has its limits. That day it was I who felt humbled; even ashamed. The softly spoken, middle-aged, father pressed into my hand two lemons, fruit from the garden he was abandoning. His house destroyed, he climbed into his overloaded Lada, and set off. To Turkey, he said, from where he would launch a court case against the Russian government. Did I think his suit could succeed? As far as I remember, I muttered something about not being an expert in the law — but he and I both knew the answer. Anyone who has reported from a war zone has spoken to refugees. The encounter described above was from Chechnya in 1995, but it has is equivalents in countless other places. Sometimes the smaller details stay in your mind. In a refugee camp in Macedonia, a child, who had fled Kosovo, cowered at the approach of a soldier. The boy was astonished when the soldier offered him a toy car, part of an aid package. I can still see the fingers holding it, hiding it; the eyes disbelieving that someone in combat gear could be kind. Leaving your homeland is not a decision easily taken. Judging from some of the media and political commentary of recent days, this is not widely enough understood in the wealthy west. While there has been compassion for those migrants trying to cross the Mediterranean in sinking vessels, there has also been a lack of humanity which belies some observers’ own. Before that famous line, Donne suggests, ‘If a clod be washed away by the sea, Europe is the less.’ If Europe is diminished by the loss of a lump of earth, what about thousands of lives ‘washed away by the sea’? Despite our world shrunken by improved communication, we in Britain are not as ‘involved in mankind’ as we should be. You will look largely in vain for any discussion of international affairs in the current election campaign. While it is normal for domestic issues such as the economy, health, and education, to dominate, it would be good to know that the political parties actually had some views on the world beyond Dover. The BBC’s World Affairs Editor, John Simpson, even wondered rather provocatively in a broadcast yesterday for The World At One what Churchill or Thatcher would have made of a Europe where Britain was so inactive. Rory Stewart, Chair of the Defence Select Committee, is not the only prominent voice to have pointed out — in an interview with Prospect — how our lack of foreign policy expertise has been costly. Journalism can also help to fill this gap in expertise. Patrick Cockburn’s work on ISIS for the Independent is a leading example. My research for my next book Headlines from the Holy Land (see previous post on this site) strengthened my impression of the extent to which policy makers rely on the news media for information. Reporters may not be able to change things overnight, but, as with the coverage of the drowning of hundreds of people in the Mediterranean this week, it can help to put matters of life and death onto the political agenda. People lived in cellars then, too. 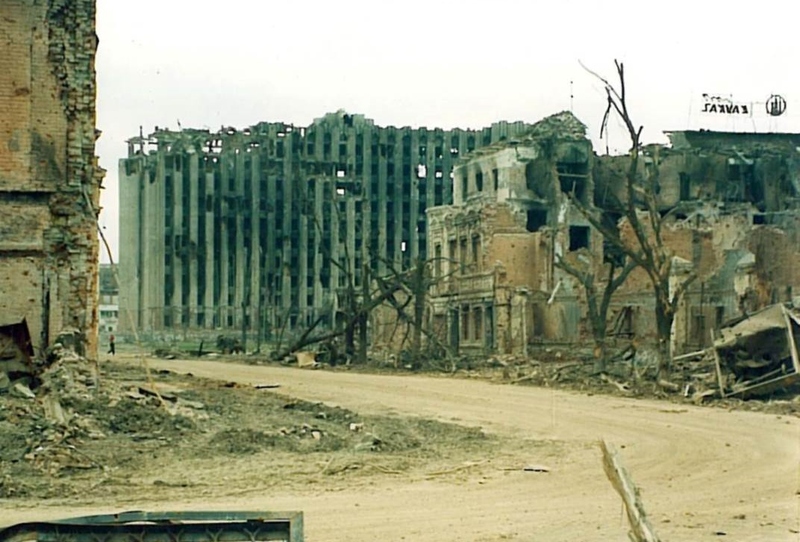 Seeing pictures from Eastern Ukraine this year, I have been reminded of Grozny during the wars of the late 1990s. Terrified and traumatized civliians hid underground as the city above their heads was flattened by bomb, rocket, and shell. 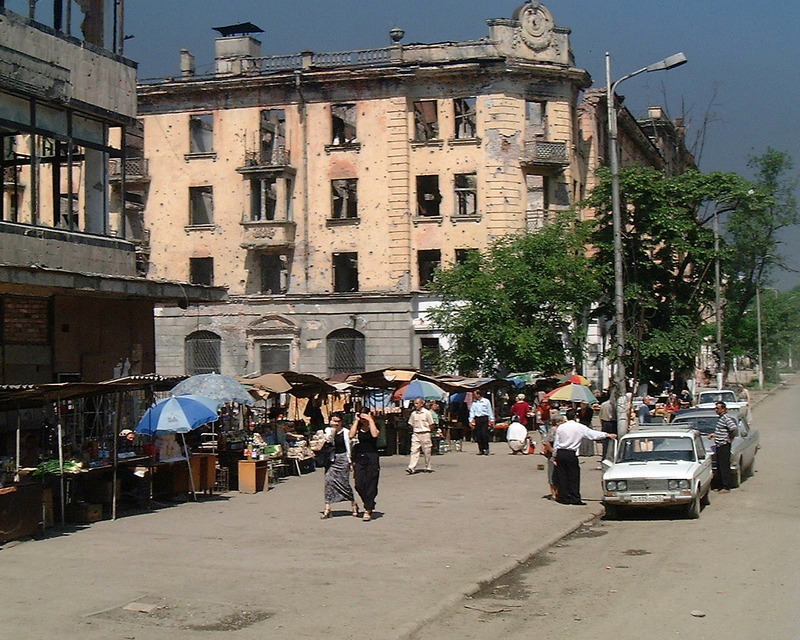 Market stalls in front of bombed buildings in Grozny, Chechnya. June 2000. For all that, political life went on. In March 2000, I was in Chechnya, reporting for the BBC on the Russian Presidential election which was to confirm Vladimir Putin in the Kremlin’s top job. Last week, the New Statesman website published a piece I wrote reflecting on Mr Putin, Russia, and the West 15 years after he won that election. You can read it here. I first went to Russia as a TV producer in the summer of 1991; my last assignment there was finishing a posting as BBC Moscow correspondent in the Spring of 2009. Earlier this year, I wrote a chapter on journalism in post-Soviet Russia. The book in which it is to appear is due to be published next year. I’ll be giving a version of the chapter as a talk at a conference in Prague next month. Last night, I was invited onto BBC World News to talk about journalism in Russia today and, on the anniversary of her murder, to talk about the times I met Anna Politkovskaya.